After our winter stopover in Iceland, we had a few days before we needed to arrive at our housesit, so we did a quick three-day tour of northern Wales. We had been wanting to go there and even though we had limited time, we decided to see what we could see in our few days out in Wales. The Sunday roast at Rowton Poplars Hotel is like Christmas dinner! We flew from Reykjavik to Dublin to Birmingham, UK. We took a shuttle from the airport to pick up our car, which was a fabulous deal – 3 days for $20. I am not kidding. I found it through Kayak which took me to Discover Car Hire which led me to Easirent.com. The office where we picked up the car kind of felt like a fraternity common room at the end of a rough semester – you know, gross couch, filthy, worn down carpet, dirty windows, etc. Some people dropping off their car warned us to check every single little ding on the car when picking it up or they will charge you through the nose upon return. We took note of that and marked every scratch and bump and hoped for the best. We drove to our accommodations outside of Chester and they were so great! For $58, including tax, we stayed on the top floor of a small hotel and pub called the Rowton Poplars Hotel. It’s a funny place with tons of character. It’s about 10 minutes outside of town. Our room had a slanted ceiling and interesting nooks and crannies because we were basically staying in the attic. It was a tiny room and it was just great! When we checked in around 5:00, our host (who was wearing a flannel shirt and a chef’s apron) said there was a carvery serving until 6:00. The cost was 12 GBP. We unpacked quickly and went to eat – and it was terrific – it felt like Christmas dinner -- so traditionally British! After dinner, we went in to Chester and walked the city walls, which was very cool. There’s a beautiful cathedral in the city and gorgeous old Tudor buildings. The Rows are 2 story shops – all along several central streets; they are very old and very cool. We enjoyed a great walk and then came back to our room for a good night’s rest. We left our cute accommodations near Chester and headed out toward Ruthin. The countryside is lovely and Ruthin is an adorable little town. We got a bacon bap (sandwich on a bun) for breakfast and ate it as we wandered around the small city. We followed the map of interesting sites we found as we walked toward the town center. There are lots of half-timbered buildings and beautiful Tudor style houses and shops decorated in white and black – they are just gorgeous. In our travel through Wales, we drove through Denbigh and stopped to walk up to the castle ruins. We just didn’t have enough time to do everything we wanted to do! I’d love to explore this village further but we basically saw the castle ruins and enjoyed the gorgeous views from the castle hilltop. We drove to the coastal Victorian resort town of Llandudno. We kept wondering how to pronounce everything. We came from Iceland where place names made no sense at all to us and Wales was not much better! We joked around pronouncing the double “L” just holding the L sound longer – only to learn later that it is like a guttural sound coming from way back in the throat. Welsh is a fascinating language. I had no idea! We walked along the beach front in Llandudno. The buildings are beautiful and you can just imagine women walking around in long dresses and carrying parasols in the 1800s. There is an Alice in Wonderland connection in Llandudno with statues of characters from the book located around town. Apparently Lewis Carroll met Alice, the girl who inspired the book, when he was visiting her family in Llandudno when she was 8 years old. She was from Lyndhurst, which we visited when we were in the New Forest last year. I love all these connections as we travel! We drove to Conwy and walked around the absolutely amazing castle there, built by Edward I between 1283-1289. It’s a beautiful, massive castle, right on the water. It is so impressive! There is a wall around the city. We could have spent lots of time here – but we didn’t have time. We drove to Penrhyn Castle but weren’t impressed – it has more modern construction. But it WAS used in filming Game of Thrones, so that was cool! We went from Svínafellsjökull glacier in Iceland where they filmed scenes from north of the wall, to Wales, with more Game of Thrones set locations. I’m excited for the new season to come out for more than one reason now! We moved on the Caernarfon. We walked around Caernarfon Castle to see the spectacular views of another amazing and historic castle built by Edward I. It is the mightiest of Edward I’s Iron Ring of castles. Then we checked in to our B&B, Marianfa, which was $69 for the night, including breakfast. What a deal! The owners are lovely! He brought us tea in our room, which was just great. We loved it. We went to the Black Boy Inn, Caernarfon pub for dinner. I’m so uncomfortable with the name of this place but they had three different explanations, one being related to a black buoy that would have been in St. George’s channel, the body of water in front of the castle. In any case, it is an awesome pub and dates from 1522. The atmosphere is fantastic and the food is fabulous! We had seafood pie and fresh mussels from the water right in front of us for dinner. It was 23.90 GBP. It was a great meal! No beer for us as it was still Dryanuary…. Breakfast at Marianfa was generous and filling – eggs, mushrooms, Welsh bacon, toast, grapefruit segments, tomato – more than enough! We sat in their cosy dining room and enjoyed the hospitality of our hosts, which was terrific. 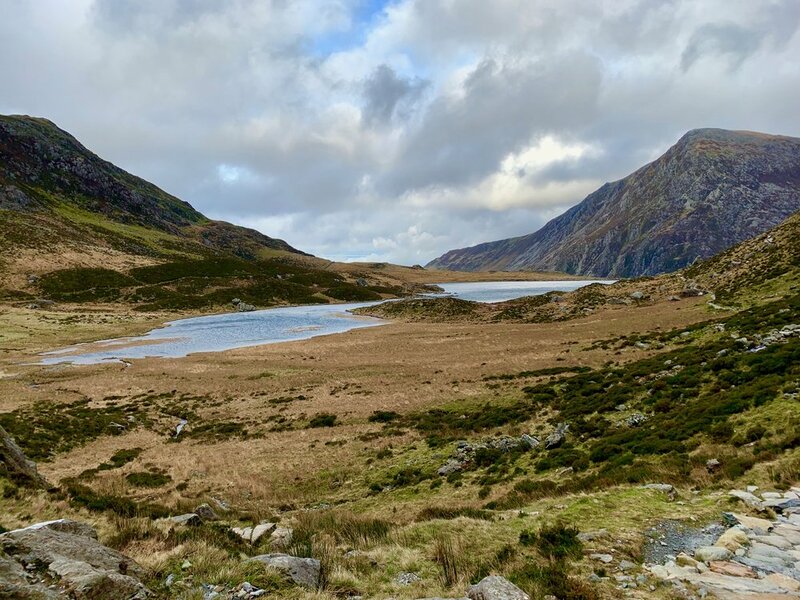 We drove to Snowdonia National Park and went to the Ogwen Cottage to find the trailhead for the Llyn Idwal (Lake) hike. It was terrific! It rained on us a bit but it was really beautiful. There were big rocks placed in the path to make the trail. We went about 3-3.5 miles all together. We took an extension up a rock fall. There were beautiful views from up there, even though the clouds were descending. We didn’t get rained on too hard. It was quite windy. We walked all the way around the lake and could see patterns of the wind on the water – it was just beautiful. We saw little ponies by the lake far below us. It was a gorgeous hike and we saw very few people along the way. We drove to Beddgelert which is a super cute little Welsh town. We wandered around and learned about the Legend of Gelert. Gelert was a dog. The prince killed the dog because he thought it hurt his son, but the dog really protected the son and killed a wolf. The prince felt guilty and buried the dog with a special marker, which we visited. The slate buildings and rocks all around this town were quintessentially Welsh. It is an absolutely beautiful town. We drove to our lodging for the night, going through Porthmedog and Blanenau Ffestinios on the way. It was raining and getting dark when we went through those towns. We weren’t too impressed. We might have enjoyed them more on a sunny day but it was drizzly and getting dark. We will return to Wales. There is so much more to see! We want to explore more of Snowdonia, Wales. I’d also like to hike Coed Ganllwyd National Nature Reserve along the River Gamlan past Rhaeadr Ddu waterfall and Swallow Falls. It would also be great to see Betws-y-Coad, Portmeirion and Powis Castle...next time. We stayed at The Coaching Barns in Wem, near Shrewsbury. It’s a funny little place. It was just fine. The cost was $70 all together. We went to the Castle Hotel (pub) for dinner. I had chicken curry and Greg had chicken with bacon, cheese and BBQ. Total bill for dinner was 18.90 GBP. The next day we drove to Birmingham Airport to drop off the car. Thankfully, we didn’t have any trouble. We returned the car with the same amount of gas we picked it up with, as we agreed in our contract. They did try to say we needed more gas. Greg told them he confirmed the gas situation when we picked up the car and they said if we gave them 10-10-10 ratings on a review, they wouldn’t charge us extra. That was an interesting kind of exchange. So much for objective ratings! We were amazed by the low cost of our time in Wales. Iceland was expensive, so that may have skewed our perspective, but Wales was still really reasonable, which was awesome! This was $63 per person per day. The book I used in 1990 to travel to Europe was Europe on $50 a day. Wales was pretty close, nearly 30 years later! I felt like our time in Wales was a step back in time. There is so much more to see. We will go back, stay longer and extend our travels south next time. Can’t wait.